HOOVER, Ala. -- Alabama football coach Nick Saban does not like predicting how "a bunch of adolescents" will perform, so he's not about to guess where his Crimson Tide will be at season's end. What he does like is where the Tide will start. Alabama opens Sept. 5 against Virginia Tech at the Georgia Dome in Atlanta, which served as a launching pad last year for the program's return to prominence. The Tide entered their '08 opener as underdogs against Clemson but won 34-10 in the first of 12 consecutive victories. "Our team gained a tremendous amount of confidence by playing on the road and playing a top-10 opponent last year," Saban said Thursday at SEC media days. "I don't think anybody would have said your team is going to go on the road to Georgia, Tennessee, LSU and Arkansas and win all those games last year. I think playing that game over there -- win, lose or draw -- probably helped our team develop a confidence of playing." The Tide posted the only 12-0 regular-season record of any team from a BCS conference last season. They earned a second trip to the Georgia Dome in December, losing 31-20 to Florida in the SEC championship game after leading 20-17 entering the fourth quarter. Alabama was rewarded for its stellar season with a first trip in 16 years to the Sugar Bowl, where the Tide surprisingly stumbled in a 31-17 loss to Utah. "It's obviously not the finish we wanted, but none of us had ever been there before," senior offensive lineman Mike Johnson said. "In terms of how you set your goals, it's hard to think about things that are ahead when they're not even on your schedule at the beginning of the year." Expectations are noticeably higher this season for a program with consecutive No. 1 recruiting classes and nine defensive starters returning. Almost every concern involves the offense, where junior Greg McElroy takes over for John Parker Wilson at quarterback and a replacement must be found for left tackle and Outland Trophy winner Andre Smith. McElroy has played in eight college games, completing 16 of 20 passes for 196 yards and two touchdowns. One candidate to replace Smith is D.J. Fluker, a 6-foot-6, 350-pound freshman. "The kid is a freak athlete," Johnson said. "He probably outweighs me by 70 pounds and moves just as well." Saban also hopes to find more explosive playmakers to complement sophomore receiver Julio Jones, who started all 14 games last season and set every Alabama freshman receiving record. The 6-4, 211-pounder had 58 catches for 924 yards and four scores. 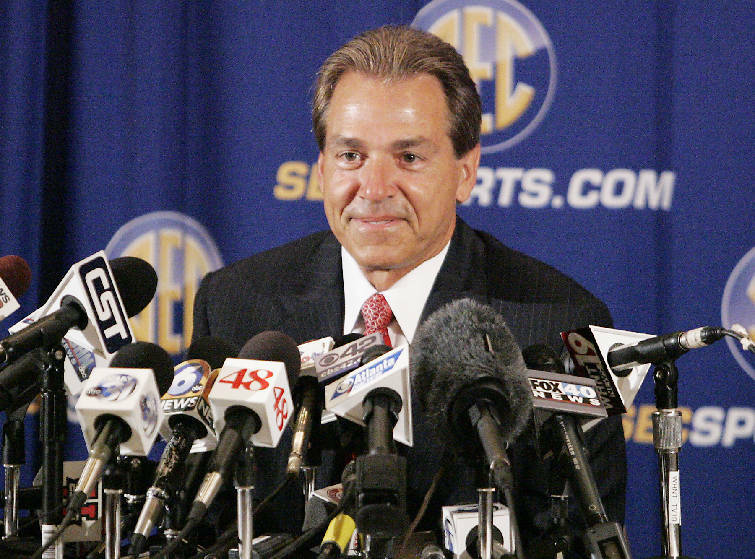 For the third consecutive year, Saban's arrival at media days easily created the biggest swarm of supporters in the Winfrey Hotel lobby. "My daddy always says you only have a problem if no one is asking for your autograph," he said. "When there is not a stir downstairs, then I've got problems."